A black and white negative of Mr. and Mrs. Harvey on the occasion of their 35th wedding anniversary. Mr. Harvey is standing behind Mrs. Harvey who is sitting. 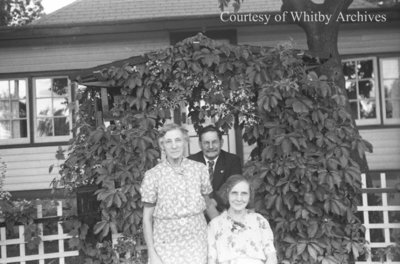 There is an unidentified woman standing to the left of Mrs. Harvey. An arbour covered in vines is visible behind them. Harvey 35th Wedding Anniversary, August 14, 1939, Marjorie Ruddy. Whitby Archives A2013_040_771D.